Enjoy today’s fabulous London wedding on the English Wedding Blog! We thought Matt was great, he took the time to meet us before the wedding for our engagement shoot and then visited the venue with us before the big day. This allowed us to get to know each other and so it felt really nice to share our wedding with him! We felt he really captured our day and we liked his casual approach, as our photos were not rigid and posed but natural. Guards Chapel, Wellington Barracks and then the Cavalry and Guards Club, Piccadilly, London. London chic with a military twist. It was so emotional to relive the day and see the joy on everyone’s faces through the photos. It reminded us what a happy and special day it was. It made us want to do it all again. Due to our London location we decided to incorporate a London theme to our wedding. Our invitations were crucial in setting the tone and it kind of evolved from there. Our London elements included a Guard of Honour (David is in the army) our London Underground table plan with table names that were significant to the people who were sitting at them. So we had some of my family at Upton Park (they are West Ham supporters) friends who live in Fulham in the Fulham Broadway table, the Guard of honour on Hounslow West (where the barracks are) etc. We wanted it to be personable to each guest. We also had a London Post box for cards and a red routemaster transporting guests from the chapel to the club. We wanted there to be accents of the London theme without it being a gimmick. We also incorporated the Jewish religion with Welsh Guard colours for the kippahs and Welsh Guard colours for our favours. It was such an emotional day and when David was saying his vows to me I did begin to well up… but we both managed to keep it together! The happy tears came on the honeymoon when we reminisced and talked about how amazing it was! We met at a party at university. It was my friend’s birthday and David was friends with her older brother so he was at the party too. He really made me laugh with his Arnold Schwarzenegger impressions! He wooed me for a while but it was the electric blanket he bought me for Christmas a few months later (I had a very cold university room and complained about it a lot!) when I realised he was the one! David proposed in the May and then he went to Afghanistan for 5 and a half months a few days later. I didn’t want to start planning the wedding until he was home safe but towards the end of his tour, whilst he was still away, he told me to check out the Guards Chapel and Cavalry and Guards club. He had been to both before and thought they would be the perfect venues for us. So I had a day in London with my parents and sister and one of David’s friends showed us around. I fell in love with both places and put the deposit down that day! We married the following August. Pull as many favours as you can! I asked lots of family and friends and friends of friends for their services and saved lots by knowing people in the right places! Also be clear on what is more important to you, do you want to hold back on the flowers and spend more on your dress or vice versa? Do you care if you have Prosecco or must it be champagne? Remember that what is important to you is different from other people, don’t be persuaded by others opinions for where to spend your money, it is your day, not theirs. My dad is good friends with an owner of a printers. I went to their office and designed the stationery with them, having got the style idea from the internet with pockets for the wedding information to go. 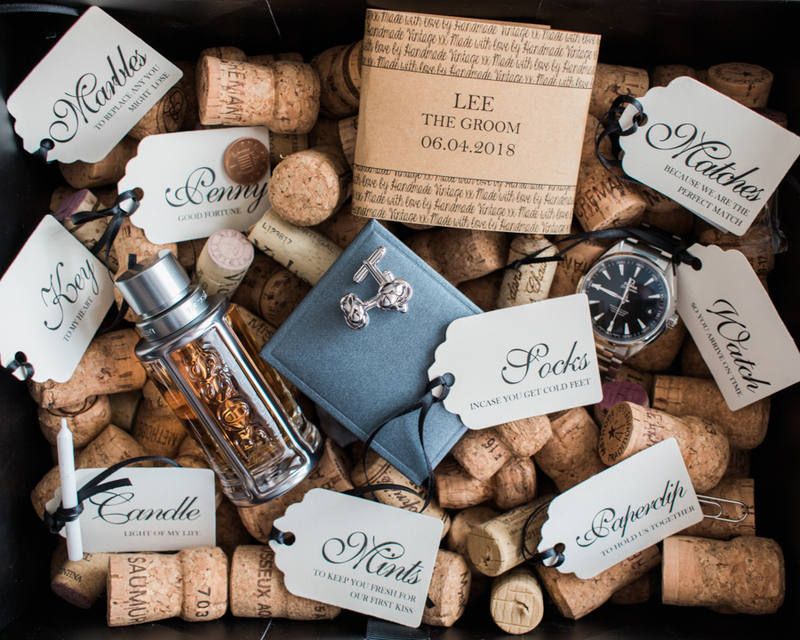 The stationery was a really important part of the wedding because it set the London theme. They also created our order of service booklets and our table name cards for us. They were great! I made the table plan myself using a vintage tube map from the internet, an ikea photo frame and lots of my dad’s printer ink! I had tried on quite a few dresses before I found ‘the one’. If I’m honest I liked quite a few of the dresses I tried on, but there was always something that stopped me from saying, ‘This is the one!’ such as I didn’t like beading on the strap or I loved the front but wasn’t as fussed for the back. My main issue was that I wasn’t sure if I wanted a big dress or a more sleek number. I decided sleek because of our city location. My sister actually picked out my wedding dress for me, I hadn’t chosen it as I had looked around the store. However, when I put it on I instantly loved the feel and quality of the silk it was made from. I loved the band around my waist, the buttons down the back and the flow of the train. The detail was so beautiful and luxurious… and although it was more than I had originally planned to spend, it was a no brainer, I had to have it! I did panic that I had made the right decision as the date approached, but I know I did, I felt amazing in my dress! Many people complimented me on it and I hope one day either my own daughters or my nieces may want to wear it (or even just the diamanté band). The dress was made by Suzanne Neville and I purchased it from The Wedding Shop in Colchester, Essex. I had a long veil with subtle diamanté around the trim. I wore a beautiful vintage diamanté hair piece to secure the veil. My shoes were from Gina and were a little wedding gift to myself. I got shoes with a small heel because I’m quite tall and I wanted to make sure I was comfortable for the whole day and could dance in the evening! David bought his suit from a local tailor. His waistcoat was from Neal and Palmer of Jermyn Street. I knew from the start I wanted my bridesmaids to be in white. I only had two bridesmaids, my sister and best friend. I wanted them to be recognised for how important they are to me by standing out and I felt the white dresses did this. I got their dresses from Net-a-Porter, they were white, lace dresses made by J Crew and they matched my dress perfectly as they were buttoned down the back with a bow. They both looked amazing in them and I still maintain that they are dresses they can definitely wear again! My friend Emily Bilverstone is an amazing make up artist and she did our make up. A family friend is a great hairdresser and she did our hair. So I pulled in a few favours here and felt so lucky to have friends in the trade that did such amazing jobs! It was also lovely to have friends share the build up and wedding preparation on the day so I wasn’t surrounded by strangers when I was getting ready. Anita from ‘Brompton Floral Designs’ was our florist. She was recommended by the club and was very familiar with the Guards Chapel. We chose Gypsophila as our main flower as I liked the freshness, relaxed nature and style of it. I had white roses in my bouquet and the button holes were white roses too. Our ceremony was really special and unique. Saying our vows to each other is a moment we will never forget and no one can describe the significance and beauty of those words when you mean them beyond anything. We had a traditional Christian ceremony and then a Jewish blessing afterwards (David is Jewish). This added a very unique twist to our day with the inclusion of both cultures and traditions. It was exclusive to us as a couple. We also had the organist playing Tom Jones songs (David is also Welsh!) whilst we signed the register, which caused some giggles and entertained the congregation whilst we were signing. Marriage Joins Two People by Edmund O’Neill was read by my best friend’s father Mike. It was important to me that he was involved as he is very dear to me and along with my own parents has been married for over thirty years so we appreciated his advice! David’s friend read The Proclaimers ‘500 miles’ as our second reading. That was a memorable moment as the words had real meaning to mine and David’s relationship and what we have been through together including his tour of Afghanistan. At the end of his reading he even received an applause, I think people were shocked to have that song as a reading but it was so poignant and very funny! Both venues had so much history there was very little we needed to do to decorate them. We wanted guests to know they were in London and to appreciate the architecture, history and the beauty of both locations. We had a ‘naked’ cake. A five-tiered victoria sponge made by my sister’s friend Victoria Parker. She did an amazing job and got fresh fruit from a local farm and beautiful white roses to decorate it. I am still in love with my cake! We had a DJ who was really good and kept people on the dance floor all night! We also had a pianist for the drinks reception. Don’t worry about a thing, go with the flow and enjoy every moment! Someone said to me beforehand to make sure David and I escaped for a moment, sat back and watched everyone enjoying themselves and to take it all in together. During the party we did just that and we loved having our own moment together away from craziness! David and I made sure our wedding day was spent together, we didn’t want to get split up talking to other people for too long and we didn’t. That was really lovely as we both have the same experience from the day. Every time I see David with his wedding ring my heart skips a beat. I love how devoted we are to each other and how we are a strong team, a family. I love saying he is my husband and I am his wife and I love being able to look to the future and only see happiness together. Great looking day with a beautifully styled wedding. Gorgeous!